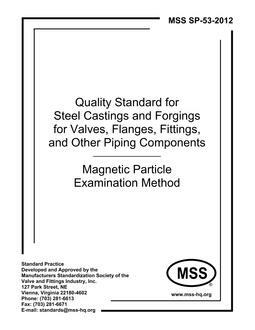 1.1 This Standard Practice is intended to supplement the requirements of ASTM Standard Specifications A216/A216M, A217/A217M, A351/A351M, A352/A352M, A389/A389M, A487/A487M, and A744/A744M, and to provide a series of reference photographs typical of the various surface irregularities common to steel pressure castings and illustrations of generally acceptable and generally rejectable quality. 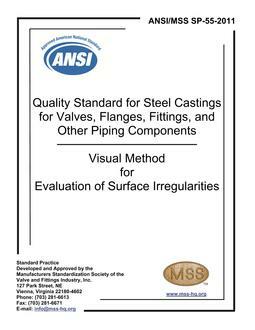 Table 1 of Section 5 is provided to show MSS interpretation as to the relationship between this Standard Practice and the levels of surface quality illustrated by the comparators and the associated photographs of the Castings Technology International (CTI), "Comparators for the Definition of Surface Quality of Steel Castings". 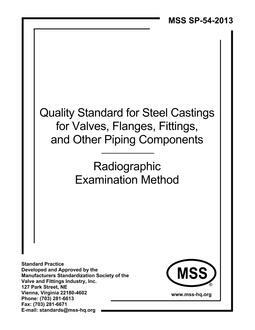 1.2 For additional nondestructive examinations defining quality of steel castings, this Standard Practice may be supplemented by the following MSS Standard Practices: SP-53, "Magnetic Particle Examination Method"; SP-54, "Radiographic Examination Method"; SP-93, "Liquid Penetrant Examination Method"; SP-94, "Ultrasonic Examination Method"; and SP-112, "Visual and Tactile Method".